It’s never too late to return to academic life, and the wave of baby boomers flooding college campuses proves it. They are pursuing new and advanced degrees for encore careers, updating professional skills, and indulging their love of learning. Going back to school has never been more exciting. 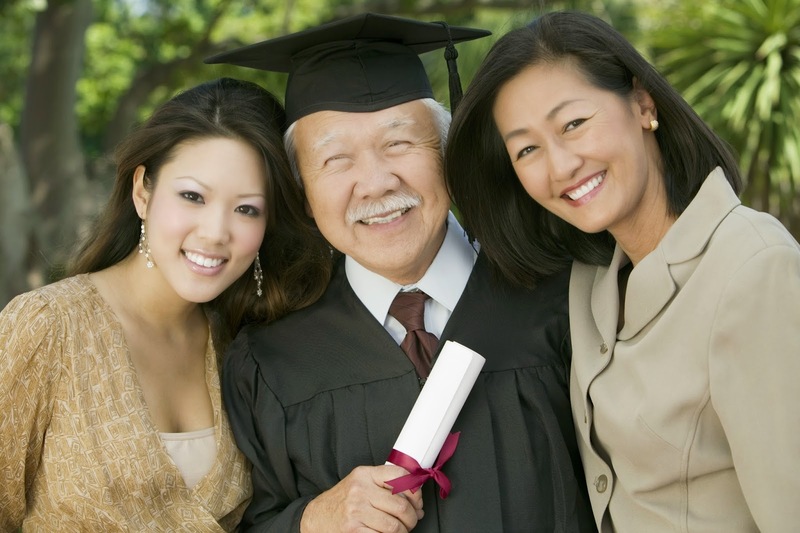 Older adults engage in higher education for many reasons. Some go back to fulfill “dreams deferred” and transition into encore careers. Others, who may have lost retirement savings during the recession, go back to update existing skills and maintain employability; and some return to class for mental stimulation, to remain socially engaged, and indulge a love of learning. Regardless of motivation, it is useful for advisors and their clients to discuss both the benefits and challenges of going back in order for this new cohort of college students to fulfill their personal and professional goals. While the benefits of lifelong learning have been well documented, a recent study suggests that the well-being of entire communities is based, in part, on the extent to which their older citizens participate in formal and informal learning activities (Merriam and Kee 2014). Further, and with a wider perspective, higher education among older adults impacts the economy and welfare of the national and global community as well, as explained in a Lumina Foundation report (Pusser et al. 2007), “Returning to Learning: Adults' Success in College is Key to America’s Future.” The study notes that fifty-four million adults lack a college degree and thirty-four million have no college experience at all, suggesting insufficient preparation among the nation’s adults to compete in a dynamic global economy. The urgency for adults to pursue higher education has also been addressed by President Obama, as reported by U.S. Secretary of Education Arne Duncan in the Adult College Completion Tool Kit (Tolbert 2012) who notes, “Shortly after taking office, President Obama set a bold goal: By 2020, the U.S. will once again have the most highly educated, best-prepared workforce in the world. In order to meet this goal, the President challenged every adult to complete at least one year of postsecondary education. In today’s knowledge economy, education is the new currency. Put simply, we must dramatically increase overall rates of educational attainment to ensure the success of individuals in the workplace and safeguard our country’s prosperity in the global economy. To do this, adult learners across America must enter and succeed in postsecondary education in ever greater numbers. Researchers Kelly and Strawn (2011) add that the country needs to graduate 10.1 million students between the ages of twenty-five and sixty-four with Associate and Bachelor degrees by 2020 in order to match the best performing countries throughout the world in college attainment. A major, nationwide program addressing this issue is the Plus 50 Initiative. In 2008, the project started with ten community colleges across the country to encourage creative curricula designed to address the needs of baby boomers to remain “active, healthy and engaged in careers and projects that matter to them” (AACC 2014). Examples of projects from early grants include retraining experienced nurses to mentor new nursing students, training individuals to become seasonal guides at national parks, and providing business education through online classes in tax preparation and medical transcription. But this was just the beginning. In 2010, the Plus 50 Completion Initiative was launched for eighteen community colleges throughout the nation to focus on degree and certificate completion for adults over age fifty. The three-year evaluation report released in August 2013 demonstrates the success of the program and the desire of boomers to participate in workforce education. With a goal of serving nine thousand students, instead it enrolled 16,507 participants earning 7,192 professional credentials in the fields of accounting, agriculture, business, health, human services, culinary arts, early childhood education, and many others (Learning for Action 2013). The most recent iteration of Plus 50 began in 2012 as the Plus 50 Encore Completion Program. This initiative is designed to help ten thousand baby boomers complete degrees or certificates in the high demand fields of education, health care, and social services (AACC 2014). Training in these areas is intended to provide pathways to employment as well as a means for boomers to give back to their communities and to the world. Although Amerikaner had the tenacity to push through to completion, most do not. Data from the National Center for Educational Statistics show that just slightly more than a quarter (28 percent) of fulltime, and a mere 5 percent of part-time older students go on to finish their college studies (Schepp 2013). In discussing the explanation behind their poor completion rate, Schepp reports findings from the Apollo Research Institute indicating several reasons why adults drop out. Examples include anxiety over college-related expenses, guilt about spending too little time with loved ones, and concern over their ability to succeed. While the cost of higher education is an understandable stressor, new online tools can help potential students select an educational program that best fits their finances. They include the United States Department of Education College Affordability and Transparency Center (2014), and the College Navigator (2014) produced by the Institute of Educational Sciences of the National Center for Educational Statistics. In addition, potential students need to apply for federal financial aid, as well as the myriad of scholarships available each year. A comprehensive resource addressing the cost of education is 501 Ways for Adults Students to Pay for College, by Tanabe and Tanabe (2013), underscores the value of spending serious time seeking out scholarships that support adults. Finally, potential students need to consider whether colleges that run by semesters, quarters, or rapid-fire, month-long terms will best fit into their lives. Online education with classes that are generally asynchronous and can be accessed any time of the day or night, continue to grow in popularity. Although some believe that online education is less demanding than traditional classes, this is false. Online offerings are obligated to demonstrate the same rigor as their classroom counterparts. However, for online students to be successful, they must be comfortable with technology, exceptionally motivated, and have enough self-discipline to persevere without the commitment of classroom attendance. In her book, The Adult Student: An Insider’s Guide to Going Back to School, Dani Babb, Ph.D. (2012) discusses online learning, including considerations about attending public versus private programs, and an explanation of the issues regarding a college’s accreditation and the potential impact on a student’s career choices. While college degrees and professional certificates generally result in lower unemployment and better paying jobs, job hunting is rarely easy at any age. However, a wide variety of resources are available to assist older adults in their job search. “New Trends in Retirement Jobs” is a CSA online article providing job seekers and advisors with extensive, practical suggestions for a successful outcome. Lastly, they should visit the websites of their local state employment offices, to inquire about workshops designed specifically for those seeking encore jobs or careers. To prove it’s never too late, this year, at age sixty-four, Susan Miedzianowski proudly earned her Ph.D. in Human Services and Gerontology. After obtaining a master’s degree on her fortieth birthday, she returned to school to reach the ultimate academic milestone. Now an adjunct professor at multiple universities, she hopes her perseverance will inspire other older adults to pursue their lifelong dreams. 1. Helping clients define their goals and then locating appropriate educational programs to fulfill those goals. 2. Exploring all avenues for financial aid. 3. Researching a wide variety of instructional delivery options. 4. Facilitating clients’ use of effective communication skills. 5. Teaching clients simple methods for time management, memorization, note taking and expository writing. 6. Encouraging clients to utilize college and university tutoring services, as well as study groups to solidify academic skills. Karen Gorback earned a Ph.D. in education from the University of California, Santa Barbara. She is currently a commissioner on the Council on Aging for the City of Thousand Oaks, California. She recently published her debut novel titled Freshman Mom, a contemporary story about a divorced mother who goes back to college. Contact her at Karen@karengorback.com, or visit her website at www.karengorback.com. Headed for the Future: A Boomer's Guide to Returning to College was recently published in the Spring 2014 edition of the CSA Journal.